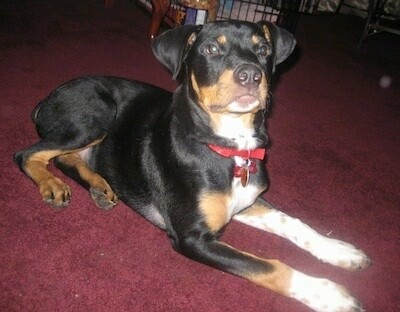 "This is Dexter, our Rottie / Bernie mix. He is 5 months old, weighs in at 58 pounds already and is very affectionate, energetic and intelligent. He has the most beautiful markings of both breeds and we often get stopped to compliment us on his pretty face, which he loves since it comes with lots of petting and praise. He knows several tricks, including the difference between "Gimme paw" and "High Five!" and loves to play with soft squeaky toys, which last about a day or two with those giant jaws of his. He is a wonderful addition to our large family and we're all looking forward to him growing into his big paws and long legs. Dexter's favorite activity is to play fetch with anyone willing to keep on throwing, and then to collapse at their feet and sleep there, leaning against his playmate." The Bernese Rottie is not a purebred dog. It is a cross between the Bernese Mountain Dog and the Rottweiler. The best way to determine the temperament of a mixed breed is to look up all breeds in the cross and know you can get any combination of any of the characteristics found in either breed. Not all of these designer hybrid dogs being bred are 50% purebred to 50% purebred. It is very common for breeders to breed multi-generation crosses. 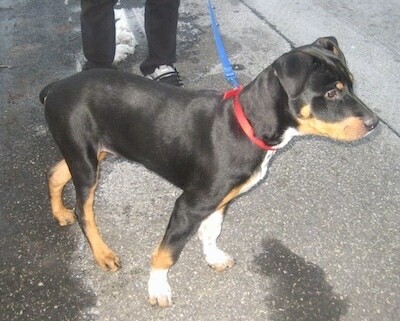 "Here is Dexter the Rottweiler / Bernese Mountain Dog hybrid at 4 months and 43 lbs.. He's a very energetic and goofy little guy who is also very affectionate (a little gassy, too). He's a big old lap dog who loves to wedge himself into wherever you happen to be sitting, and loves to sleep in his owner's big, comfy bed. He's extremely intelligent, and has learned many tricks in just over a month of training. He is still getting used to the idea of potty training, and will excitedly urinate and submissively urinate when he is greeted after being left alone. He's top of his class in his puppy training courses. Dexter gets taken out to "do his business" many times a day, and is taken on a long walk daily." "I have just started watching Cesar Millan's show, and have greatly benefitted from some of his philosophies. Dexter no longer tries to lead the leash holder on his walks, but instead stays either behind or right by their side. He never goes in or out of the door first, and waits his turn to do so. Also, he tends to jump up and put his paws on people, which we learned is him being dominant, so we've been stopping that behavior."